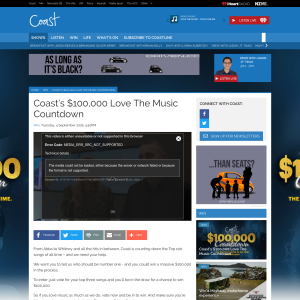 From Abba to Whitney and all the hits in between, Coast is counting down the Top 100 songs of all time – and we need your help. We want you to tell us who should be number one - and you could win a massive $100,000 in the process. To enter, just vote for your top three songs and you’ll be in the draw for a chance to win $100,000. So if you love music as much as we do, vote now and be in to win. And make sure you’re listening when we count down the Top 100 on Friday October 5.